Can Dogs Have Best Friends? The worst breakup of my life was devastating for me not because of the feelings of personal loss over the relationship with the man I was with, but because of the sheer heartache I felt in having to separate my Pugs Willy and Bruce. 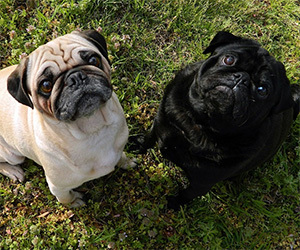 The Pugs are yin and yang, polar opposites in personality and looks but connected at a deep level since puppyhood. They share a relationship I can describe only as being the best of friends. I was so upset at the prospect of separating the two that I considered staying in the relationship “for the sake of the kids.” But alas, knowing the separation was inevitable, I faced the reality that I would take one of the Pugs while my former partner took the other. The day we parted caused unbearable grief. Through nearly uncontrollable sobs, I clung to Willy, who had taken me on years before as his human companion of choice. I couldn’t explain to him what was happening or why in a way that he understood. I know from my years of experience as a dog trainer and from working in the veterinary setting with my veterinarian father that change and loss can be triggers for behavior problems, in particular anxiety- and stress-induced issues. Dogs both perceive and emotionally react to change and loss, as can be evidenced by increased depression- or anxiety-based behaviors. Each of the Pugs displayed their stress in manners that were distinct from their norms, with Willy becoming sullen and withdrawn and Bruce being overly anxious and unable to settle when I visited him. The few months apart were difficult for both dogs, and even though other canine friendships were struck, no other dogs seemed to fill the void. Much to my relief, my previous partner noticed the stress in Bruce, and in an act I’m forever thankful for, agreed to give him to me. The reunion was one of monumental proportions, with both dogs’ entire bodies wagging in joy and tongues licking one another in exuberant greeting. They bounded into the backyard with triumphant leaps and what looked like a dance of joy. Since being reunited, the Pugs have not left one another’s sides and take on life as if it’s a team effort. At the doggie day care, the Pugs are staff favorites simply because the folks there have never seen two dogs so close. Willy and Bruce are constantly touching, squishing into only one-eighth of a giant bed so they can be cuddled together rather than spaced apart. All the details of life seem best if done together for them; sniffing, exploring, playing and grooming are done in sync. Though Bruce is the athletic meathead who has more brawn than brain, choosing to act first and think later, and Willy is the brainy Einstein dog who puts many Border Collies to shame with his ability to think, they join their personalities to form a “collective dog” with the best of both their qualities. Though I can’t prove dogs have best friends, I believe they do based on what I’ve personally experienced with my best friend and the direct parallel I’ve seen forged between canines and their companions of choice. A best friend is a rarity, coming once in a lifetime for some or as a few spread throughout the years for others. My relationship with my best friend since childhood is one of the deepest intimacy, in which it feels like we were made of the same piece of cloth and share the same heart. We can be our authentic selves and know that we are loved not in spite of it, but because of it. No one on earth can reach my heart the way my best friend can, because a piece of my heart was made specifically for her, and no one else can fill that place. I see that type of friendship within certain relationships dogs share with others. For some dogs it’s another canine, while other dogs befriend other species, people included. Even the least social and most choosy of dogs can develop an intimate relationship with a best friend. My parents’ dog Quixote is a great example of that phenomenon. The Pomeranian mix is a “people dog” who merely tolerates other dogs or has loose social relationships with the bigger dogs on my parents’ ranch but seemed fairly distant from other canines. My parents considered adopting another dog, since the bigger dogs seemed bonded to one another and Quixote seemed left out. Yet adding another dog did not seem like the appropriate solution for him, as his tolerance toward the other dogs ran only so deep, especially if they appeared to infringe upon his relationship with his human family. Whenever I went home to visit, the Pugs were treading in turbulent water around Quixote, who stiffened and prepared for a fight over seemingly small and insignificant incidents that were a big deal to Quixote. For that reason, another dog seemed like it would add more stress than good to his life. The one small dog in the household changed completely, though, on the day shelter dog Quora found our family. Based on her charm and physical likeness to Quixote — she looked as if she could be a sibling — my parents decided to adopt her. Immediately, Quora and Quixote were a pair. The grumpiness and gruffness of Quixote, especially around the human family, disappeared with Quora. Instead, his behavior reflected the affection of an inseparable bond. Though Quixote can be short tempered with other dogs, he gives Quora priority access to all the best things in the home. Showing no propensity to guard against her, Quixote instead defers to her, even though she displays no signs of being intimidating to get the access she’s given simply out of what appears to be his own desire. Dogs are man’s best friend — and girl’s best friend, too. My now 4-year-old daughter, Reagan, was adopted two years ago by a 12-year-old Pomeranian who took on my little girl as his person of choice. Though it’s true that many dogs are nervous and uncertain around children, Teddy actively sought out Reagan every moment of the day. He not only wanted to sleep by her, walk by her and nuzzle up next to her, he even was allowed by her day care provider to accompany her while she was there, since they both seemed most calm when with the other. We had Teddy for only one year, as he was a rescue with numerous health issues. But during our short time with Teddy, he displayed such love, devotion and loyalty to my daughter that he helped shape her in ways that are still visible. There’s not a week that goes by when Reagan doesn’t tell me that one day when she gets to heaven she can’t wait to see her Teddy and give him a big hug and play with him, because she misses him so much and he was the one who chose her as his best friend. The best friend of some dogs happens to be a canine they’ve grown up with since puppyhood. For others, it’s a dog they found in a social setting, like doggie day care. For others — like Teddy — friendships are struck with people they become highly bonded to in a manner that far exceeds normal canine affection. Companions who are chosen time and time again as friends — the ones who bring out the best qualities of the authentic self of the person or animal — are those I feel are best friends. Though not every dog has a companion who would seem to qualify for best friend status, those who do make their choice evident. Life for me has changed numerous times, but what has stayed constant is the reminder from my own human best friend and from my Pugs and their relationship with one another that real love lasts. Even tonight as I write this article, the Pugs are snuggled up together, with Willy lying partially splayed atop Bruce, breathing in-synch snores from the couch. The touching line from adventurer Christopher McCandless in the book Into the Wild comes to mind: “Happiness [is] only real when shared.” When we share life with others in intimate relationships, life abounds. And with a best friend who sees beyond the exterior and reaches deep into the heart and soul, the happiness and connection shared are beyond description. But they can be felt or seen through the joyful expressions on the faces of companions who happened to find one another.